I have a Honda Accord 2007, and I noticed it was leaking between the bellhouse (transmission fluid for sure). I took it to a shop (not the dealer), they cleaned it , and replaced the gasket between the motor and transmission. That was two months ago, I took it back because I noticed it seap again, and they tighted the bolts to see if that would work. I noticed the next day there was seapage, and it's still wet as you can see in the motor. Mind you, when I first took it in it wasn't leaking bad, but I would have a few drops on the floor, and it smelt like burnt oil in my garage. It still smells like burnt oil in my garage after driving. I am not a mechanic, nor am I some whizz when it comes to cars, but can someone on here maybe give me some advice on what may be causing this to coninue to leak? So I can talk to the shop when I take it back. It seems slow right now (no drops on the floor, maybe one every couple days if that that). My 2007 Honda Accord V6, has 111,000 miles on it. Hard to tell from the picture, but I don't see any evidence of the leak being ATF. 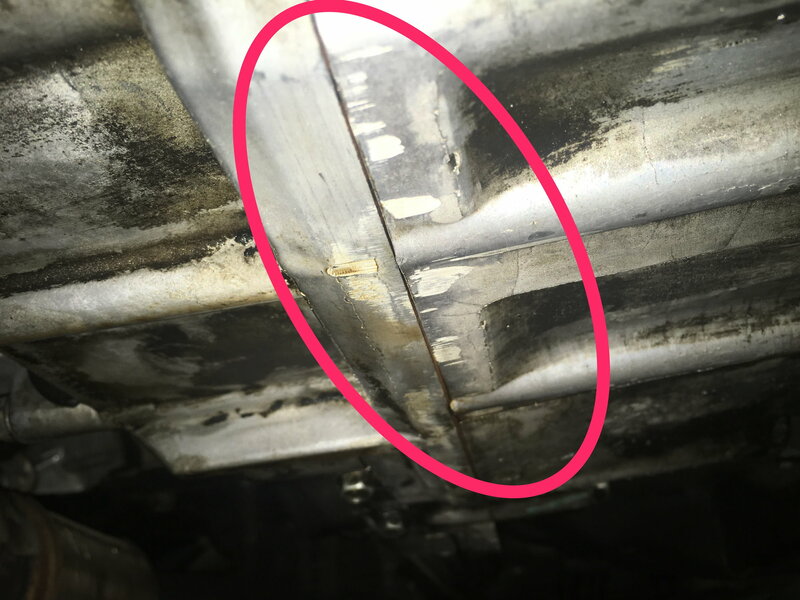 Regardless, you have a leak and all of the tightening of the transmission to engine bolts in the world won't stop the leak. Ok, thanks Shipo. I took it to another shop. Come to find out based on two mechanics opinons, the shop only replaced the engine oil pan, and didn't do anything to the transmission, because they indicated that there is no seal in that location other than the rear main seal, and that it's sealed with sealent in that area.... hence the reason why I left the shop (pretty pissed off about that). When I took it to this shop they saw I had motor oil leaking from the timing belt case, so I had the new mechanic replace the timing belt/water pump and everything in that area w/ a new power steering pump, drive belt, and motor mounts (they were shot). He said that he isn't too concerned with the seapage that is coming from that area, and it could be a weak rear main seal, but since it's a small amount and I am only getting a small drop every couple of days that it isn't a concern for him at this moment and that it's normal for a car with this amount of miles on it to see a small film layer of oil in that area. What do you or anyone on this forum think? Is that true, and should I wait until it becomes a bigger leak (if it does)...? Who knows how many more miles it can go.... but I am not losing a significant amount, and my transmission levels is where it needs to be. Here's the truth of oil leakage; oil is cheap, very cheap, even if it is leaking a quart every 1,000 miles and even if you use say a $6.00 per quart type of oil, you're talking about a relatively insignificant $600 spent on oil for 100,000 miles. Diving into the engine to repair the leaks will easily cost significantly more than that. Ok, thanks shipo. What about doing a fluid exchange for the transmission at the dealership? Do you think new fluid will help with the seapage or speed up the process of the leak haha? I know I am due for another service for that fluid. Last time I did it, I think the car was at 60K. Doesn't typically have an effect either way.